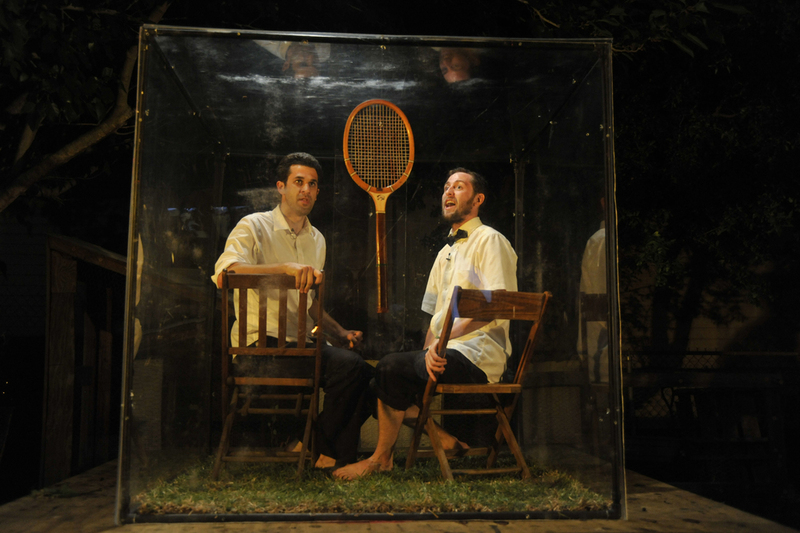 Two men in a box decide to elect a tennis racquet named Ronald Reagan their president. Our Man is a comedic multidisciplinary performance work that explores the intersection of performance and politics in the modern age, through the lenses of 1950’s era radio broadcasts, and a decidedly fictional approach to American political history. Two men in a small glass box are tasked with narrating the life and accomplishments of one of the nations most controversial leaders, “The Gipper”. Forced to perform the same radio play over and over again for an invisible audience, the lines of fact and fiction blur as the men begin to slowly re-write the course of history in an effort to entertain each other and understand the context of their unusual situation. Through clever and hilarious half truths and brutal mudslinging tactics, the two find themselves arguing their way through small towns in the Midwest, to Europe on the front lines of WWII, all the while deciding whether or not to elect their only possession, an old wooden tennis racquet, their President. After premiering at the New Orleans Fringe Festival in November 2010, Our Man had subsequent performances at Interstate Fringe in Houston, TX, at the Bloomsburg Theater Ensemble’s Mitroni Studio in Bloomsburg, PA, Underground Arts in Philadelphia PA, and at the 2011 Berkshire Fringe Festival in Great Barrington, MA. Our Man was included in the NOLA Defender’s “5 Arresting Moments” of 2011.